Haslam and Alexander among the no-shows; rivalry between Democratic Senate candidates Adams and Ball on display, and 'Coonrippy' Brown is showcased. The races in question were those for the 7th Congressional district, the U.S. Senate, and the governorship, and, while candidates for all three offices did indeed turn up, none of them happened to be the current incumbents. — a circumstance that, early on, became the major focus of the evening. In the first encounter, involving the congressional candidates, Democratic hopefuls Dan Kramer and Credo Amouzouvik took turns lacerating incumbent Republican Marsha Blackburn for her absence, which both described as “disrespect” to the community, and demanding that her West Tennessee field representative, John Blakely, who was standing in for her, leave the stage. The beleaguered Blakely, apologetic and clearly embarrassed, was ultimately allowed to remain, though he declined to answer some of the policy questions asked by the debate moderators, pleading that he was not well enough versed in them to speak for Rep. Blackburn. Incumbent GOP Senator Lamar Alexander took some lumps in absentia, as well, during the Senate debate. 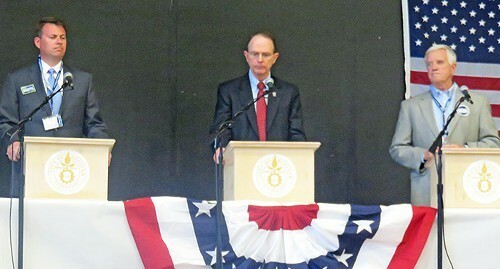 George Flinn, the Memphis physician/businessman who seeks the Republican nomination, apologized to the middling-sized audience in the Bolivar Middle School auditorium, for the absence of both Alexander, whom he described as ensconced, alternately, in “an ivory tower” and a “bubble,” and the Tea Party-backed Joe Carr. The two leading Democratic candidates for the Senate, Knoxville attorneys Terry Adams and Gordon Ball, were both there, and both of them, too, took shots at Alexander for his absence, but both were more involved with the subject of their own rivalry. Adams took the offensive, chastising Ball for his support of the proposed Keystone oil pipeline and for a flat-tax proposal which Adams said would raise taxes for ordinary folks and cut them for the rich. Adams called Ball, a successful class-action lawyer, a “multi-millionaire” who in previous campaign years had crossed party lines to support both Alexander and GOP governor Bill Haslam, and who, moreover, had previously represented Haslam’s company, Pilot Oil. Adams said he doubted that Ball and could “stand up” to Haslam, whom both Democrats excoriated for failing to accept Medicaid expansion and for other alleged shortcomings in office. Tennessee, expanded veterans’ benefits, and increasing the minimum wage. At the end of the Senate debate, the two of them left the stage arm in arm. In the gubernatorial debate, incumbent Haslam came in for criticism, too. 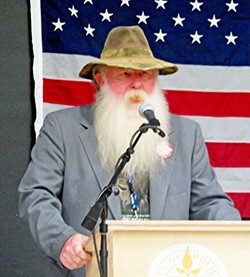 The most memorable came from Mark “Coonrippy” Brown, the bewhiskered eccentric from Gallatin who affects a mountain-man garb and is a candidate in the Republican primary. County Homeland Security director holds kickoff rally in Millington; considered major contender for GOP nomination. Appraising what he sees as a racially based appeal, a U of M Law professor questions the bona fides of a campaign mailer from mayoral candidate David Lenoir about his opponent, Lee Harris.